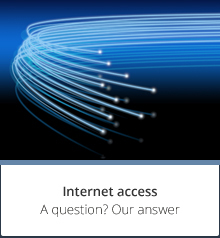 Internet access service using standard telephone lines, with higher bandwidth than that use for telephony. Download speed is higher than upload speed. High-speed (up to 20 Mbits/sec for downloads). ADSL 2+ is an upgrade of ADSL technology, using more carrier frequencies for data (up to 2.2 MHz). This means an increase in the peak speed. Technology largely rolled out in France at the current time. Independent administrative body responsible since January 5 1997 for regulating the telecommunications and postal sector in France. It has a board of seven members, three of whom are appointed by the President of the Republic and four others respectively by the President of the National Assembly and the President of the Senate. Concept aimed at improving high-speed access using the various wireline (MeD, FTTH, FTTLA) or hertzian (WiFi, WiMAX, LTE, satellite) technologies. Youth information service. In Orne, the BIJ has been granted the mobile EPN (public digital centre) label. The JBUS and its qualified multimedia coordinator travel across Orne to facilitate access to the internet and multimedia services. Specific form of end connection where the optical connection point is located on one of the upper storeys of a building. Any person responsible for the establishment or management of one or several lines in a building, most notably within the framework of a line installation, maintenance, replacement or management contract signed by the owner or co-owners, in application of article L. 33-6 of the French postal and digital communications code; the building operator is not necessarily the operator as defined by article L.33-1 of that code. Operator that can be selected by the end user for provision of a digital communications service or by a service access provider to provide a digital communications service to its own end user. Network transmitting communication services, with the signals carried in digital or analogue form. Premises for which there is continuous optical connection between the shared access point and the optical connection point, or between the shared access point and the optical terminal unit if the optical connection point is not available. Premises where there is continuous optical connection from the shared access point to the optical terminal unit. Part of the cabling infrastructure, between the operator network connection point and the point of entry. It may be overhead, overhead-underground or underground. It comprises the necessary civil engineering components: cable chambers, ducts, posts and other hardware. Extensive copper part of France Telecom’s electronic communications network, used to connect any end user to network equipment, located between two cable glands on the main distribution frame and the network termination point (NTP). High-speed (up to 6 Mbits/sec). Intermediate distribution frame area, with no transmission network, where the distribution network is connection to the main distribution frame located within its subscriber connection node. Device used for bundling, switching and distribution of telecommunications cables. It may serve a campus, a building, a storey or a household, depending on its location and function. Active device connecting subscribers’ copper lines to provide data services (ADSL, VDSL, SDSL, etc.). Currently, this device is fitted in subscriber access nodes but will be fitted in the intermediate distribution frame where data speeds are increased. Premises for which at least one operator (which may be the building’s own operator) has connected the shared access point to its optical node, and for which all that is required is the final connection and, where necessary, switching to the access point to ensure continuous optic connection from the operator’s optical node up to the optical terminal unit. Operation whereby a connection cable made up of one or several optical fibres is fitted between the optical connection point and the optical terminal unit. Conventionally, there is no end connection if there is no optical connection point. In an educational context, a digital workspace is a shared work platform providing a number of dematerialised services specific to the national education system. Educational content, assignment books, timetables and general information on life at school will soon be online for anyone to consult from a computer. Public digital centres are open to all. They are equipped with computer equipment and high-speed internet connection, and are supervised by professional multimedia coordinators. Place where all the connections between the wireline telephone network and the customer’s copper end point terminate (local loop). The new generation of fibre optics able to deliver the much heavier datasets required by new internet uses (images, television, etc.) right up to users’ homes. Wireless technology is no rival for this kind of performance. HS (High Speed). From 1 to 50 megabits per second. High-speed internet access (often referred to as broadband internet) is faster than that provided by a dial-up modem (usually 56 kbit/s). HFC networks are a form of hybrid architecture combining optical fibres and coaxial cables. Switching point for the copper wire network, usually in the form of a cabinet located on the public highway. It serves from tens to hundreds of lines. Geographical area served by a primary intermediate distribution frame or a direct distribution area as described in France Telecom’s local loop information system. Operator providing connection to the internet network. This is the unit used to measure digital speeds. The term local authority, as used here, refers to any administrative division, below State level, that is run by an elected deliberative assembly distinct from the state: local communities (village or town councils), departments (such as Orne Council), regions. Internet connection with speeds under 1 megabit/second. Device used to distribute the copper wires that make up subscriber lines between the cables connected to the subscriber switch, serving to bundle several lines over a single transmission cable. The main distribution frame is hosted in the subscriber connection node. Launched in June 2010, this scheme aims to provide very high-speed internet access for the whole country by 2025. All equipment, including raceways, managed by one or several operators/distributors upstream of the delivery point, used to distribute electrical energy or communications services. Operator of a digital communications network open to the public or a public digital communications service provider, declared in compliance with article L.33-1 of the French postal and digital telecommunications code. This is fine glass tube, used to carry data via the modulation of light beams. Speeds can reach several hundred megabits or gigabits/second. Concentration point in an optical fibre network where we find the active equipment used by an operator to activate subscriber access. 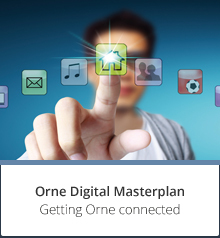 The updated version of the Orne digital development masterplan (known in French as the SDAN), defined in 2011. This masterplan endeavours to reduce the digital divide, to boost the area’s appeal and develop new uses. While limiting the financial impact on public finances, it aims to provide very high-speed access for three different targets: public sites, business and industrial parks and residents. For each of these targets, Orne Council will work hand-in-hand with private initiatives and, as far as possible, reuse the existing collection infrastructures to focus investment on user service. Fibre optic roll-out technology where each household is connected to the optical connection node by an end-to-end fibre. Fibre optic roll-out technology where a single fibre from the optical connection node is used to serve several households (up to 64), using splitters to replicate the signal. This term does not have a specific, shared definition, so it is preferable to use the ARCEP definitions marked with an asterisk. Eligible premises for which several operators have connected a shared access point to their optical node. 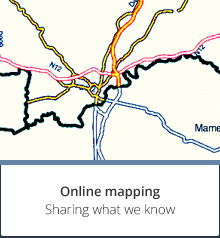 Digital communications networks established and run by local authorities and their groupings, within the framework of article L.1425-1 of the French local authorities’ code. Reach extended ADSL2 is a high-speed access method used to increase the reach of ADSL with regard to the copper line length. It is covered by appendix L. of recommendation G.992.3 (or ADSL2) from the ITU. This defines the main areas of focus for regional stakeholders, to ensure that all geographical areas are covered by a local digital development masterplan (known as the SDTAN). DSL system of access able to carry data at high speeds across a network (up to 2 Mbit/sec with maximum range of 2.4km for a line, and the possibility of bundling several lines where available, and where the download speed is equal to the upload speed. Introduced with the law dated December 17 2009 aimed at reducing the digital divide, the SDTAN defines a network development strategy at department level, at the very least. It ensures coherence between public initiatives and how they link up with private investment. Where there is single-injection access to the local sub-loop, France Télécom can set up a shared access point located near the intermediate distribution frame. The shared access point hosts the main distribution frame and the operators’ active equipment, to provide the high-speed service. Place for which the occupant has subscribed to an offer from a commercial operator based on a fibre optic network that runs up to the subscriber’s living or working space. Premises located in an area behind a shared access point, for which the shared access point has been fitted and made available to third-party operators, according to the terms of the appendices to decision n° 2009-1106. New subscriber connection node implemented as part of the shared access point offer from France Télécom. Subscriber connection node including the main distribution frame that serves the intermediate distribution frame area affected by the bandwidth upgrade. Section of the network between the shared access point and the optical terminal unit. The terminal section is made up of a set of lines. Technology using a pair of copper wires enabling average speed of 30 Mbits/sec for downloads and 5 Mbits/Sec for uploads, over a distance of 700m. A development of ADSL2+ technology. VDSL2 Vectoring improves performance by 50% but is not possible with unbundling. The highest data transmission speed: over 50 megabits/second. Passive liaison to a very high-speed local loop network comprising one or several continuous fibre optic paths, to serve the end user. Voice over IP, or VOIP, is a technique enabling voice communications over IP compatible networks, which may be private networks or the internet, using wirelines (cable/ADSL/optical fibre) or otherwise (satellite, WiFi, GSM). This technology is mainly used for IP telephone services (TOIP or Telephony Over Internet Protocol). All forms of technology enabling an individual or a company to connect to their operator (fixed line telephony, internet, television) via radio waves. This type of local loop can complete the standard wire lines. All wireless communication protocols covered by the standards in group IEEE 802.11. A WiFi network can be used for the wireless connection of several electronic devices (aerials, computers, telephones, routers, internet decoder, etc.) within a digital communications network to transmit data between devices.